In 1939 Japan acquired a licence to build the Lockheed 14 Super Electra (14-WG3B Export Version). A total of 119 Army Type LO Transport aircraft were licence built and powered by two 900 hp (671 kw) Mitsubishi Ha-26-I 14-cylinder radial engines. They were latter allocated the Allied Codename "Thelma". Production of this aircraft was undertaken by both Kawasaki and Tachikawa. The range and handling of the aircraft was so outstanding that Japan decided to build its own version. The first two prototypes flew in November 1940 and were characterised by a longer fuselage, an altered wing support system and an overall lighter weight structure. 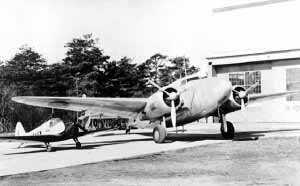 It was also decided to use two 990 hp (739 kW) Nakajima Ha-25 14-cylinder air-cooled radial engines. The plane could carry 5,280 lbs (2395 kg) of cargo or up to 14 passengers. It utilized a four or three man crew depending on range and passenger/cargo capacity required. Overall it had better flight and handling characteristics than the Lockheed aircraft it was developed from. A total of 121 aircraft of this type were produced by Kawasaki before production was halted in September 1943. Accommodation/Crew: Pilot, Co-Pilot, Navigator and Radio Operator. (Short Range) Pilot, Co-Pilot, Navigator/Radio Operator. Manufacturer: Kawasaki Kokuki Kogyo Kabushiki Kaisha (The Kawasaki Aircraft Engineering Company Limited). Powerplant: Two 990 hp (739 kW) Nakajima Ha-25 14-cylinder air-cooled radial engines. Performance: Maximum level speed 248 mph (399 km/h) at 11,480 ft (3500 m); service ceiling 24,300 ft (7405 m). Range: 2,060 miles (3315 km) on maximum internal fuel (estimated) with 5,280 lbs (2395 kg) of cargo or 14 passengers. Weight: Empty 10,300 lbs (4672 kg) with a maximum take-off weight of 17,692 lbs (8024 kg). Dimensions: Span 65 ft 6 in (19.66 m); length 48 ft 10 in (14.88 m); height 11 ft 9 in (3.58 m); wing area 551.0 sq ft (51.19 sq m). Variants: Ki-56 - based on the licence built Ki-56 Army Type LO Transport (Lockheed 14-WG3B Export Version) later given the Allied Codename "Thelma". Equipment/Avionics: Standard communications and navigation equipment. History: First flight (prototype) November 1940; end production September 1943.